"I think it will be a really lovely experience for people walking by. The family was quite happy with the decision," said Kenneth Hemmerick, Peterson-Sweeney's son. 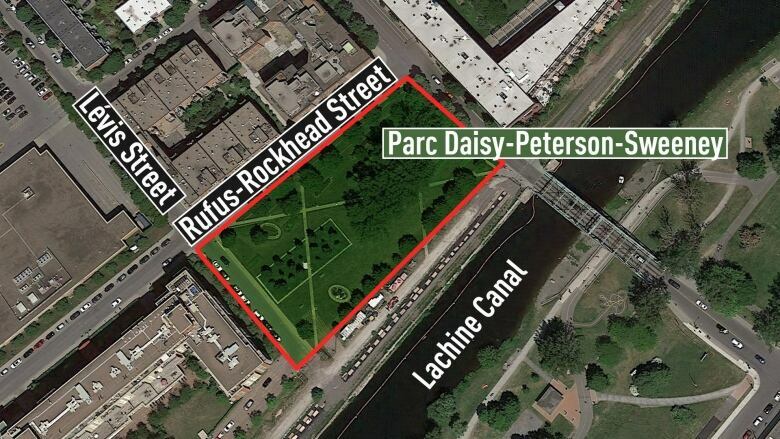 The City of Montreal's executive committee has approved the new location for a park honouring Daisy Peterson-Sweeney. "I'm so glad that we found a great compromise," said Montreal Mayor Valérie Plante after Wednesday's committee meeting. "We do believe Mrs. Sweeney deserves a great place." The Montreal piano teacher and musician died in August 2017 at the age of 97. Montreal's mayor at the time, Denis Coderre, said that a street would be named after her. But the following year, it was announced that a small park at the corner of Guy and Paxton streets in Little Burgundy, where she lived, would instead take her name. Peterson-Sweeney's family criticized that location as "a very small patch of grass" that did not live up to her legacy. The family now says that the new location, about one kilometre west of the smaller park, along the Lachine Canal, is a huge improvement. "I think it will be a really lovely experience for people walking by. The family was quite happy with the decision," said Kenneth Hemmerick, Peterson-Sweeney's foster son. "In addition to being an amazing piano teacher, she was a very warm-hearted, kind person, who took in children left, right and centre." Plante met Hemmerick, along with other members of the family, as well as jazz pianist Oliver Jones, who was a student of Peterson-Sweeney's, to discuss the park's location. The city gave them three options, and the family chose the site along the Lachine Canal bordered by Rufus-Rockhead Street. Hemmerick said they chose the site because of its beauty and because they will also get the section of de Lévis Street that borders the west side of the park renamed after his mother. It's also close to Union United Church, something the family wanted. "I am deeply appreciative of Mayor Plante and her team's willingness to hear the concerns that both my family and I shared," said Peterson-Sweeney's niece, Céline Peterson, in an email. With Trevor Payne, Peterson-Sweeney founded the Montreal Black Community Youth Choir, which later became the world-renowned Montreal Jubilation Gospel Choir. Hemmerick, who still plays piano after being taught by Peterson-Sweeney, remembers his mother's voice echoing down the hall as she corrected students playing notes off-key. "I can still hear in the background, 'B flat!'" he said. He said he expects the park to be inaugurated this spring.